3D printing isn’t just cheaper, it’s also greener, says Michigan Technological University’s Joshua Pearce. Even Pearce, an aficionado of the make-it-yourself-and-save technology, was surprised at his study’s results. It showed that making stuff on a 3D printer uses less energy—and therefore releases less carbon dioxide—than producing it en masse in a factory and shipping it to a warehouse. Most 3D printers for home use, like the RepRap used in this study, are about the size of microwave ovens. They work by melting filament, usually plastic, and depositing it layer by layer in a specific pattern. Free designs for thousands of products are available from outlets like Thingiverse.com. Common sense would suggest that mass-producing plastic widgets would take less energy per unit than making them one at a time on a 3D printer. Or, as Pearce says, “It’s more efficient to melt things in a cauldron than in a test tube.” However, his group found it’s actually greener to make stuff at home. They conducted life cycle impact analyses on three products: an orange juicer, a children’s building block and a waterspout. The cradle-to-gate analysis of energy use went from raw material extraction to one of two endpoints: entry into the US for an item manufactured overseas or printing it a home on a 3D printer. Pearce’s group found that making the items on a basic 3D printer took from 41 percent to 64 percent less energy than making them in a factory and shipping them to the US. Some of the savings come from using less raw material. “Children’s blocks are normally made of solid wood or plastic,” said Pearce, an associate professor of materials science and engineering/electrical and computer engineering. 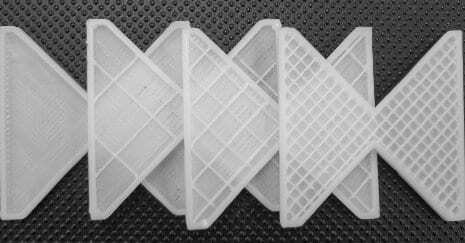 3D printed blocks can be made partially or even completely hollow, requiring much less plastic. Pearce’s team ran their analysis with two common types of plastic filament used in 3D printing, including polylactic acid (PLA). PLA is made from renewable resources, such as cornstarch, making it a greener alternative to petroleum-based plastics. The team also did a separate analysis on products made using solar-powered 3D printers, which drove down the environmental impact even further. April 17, 2019 - VA Looks to 3D-Printing to Improve Veteran Care NextgovThe agency is funding efforts to 3D-print hand braces, foot insoles, prosthetic limbs and artificial organs. April 18, 2019 - The Untold Truths of 3D Printing You Need to Understand DesignNewsWith all of the hype surrounding additive manufacturing and 3D printing, it's easy to forget that, as with all new technologies, there is a learning curve.